Known as the "Grand Canyon of Texas" for its size and brightly banded geological formations, Palo Duro Canyon is a dramatic and colorful slash in the flat topography of the Texas Panhandle. Hikers, campers, and sightseers treasure the nation's second largest canyon, much of which is protected by Palo Duro Canyon State Park. 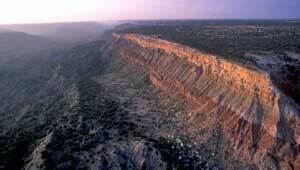 But large swaths of the canyon rim have remained privately owned, including the nearly 3,000-acre Fortress Cliffs Ranch, named for a six-mile-long ridge of rock that is one of the canyon's signature sights. The ranch was listed for sale in 2008, raising the very real possibility that large homes could be built there. That year, TPL stepped in and acquired the ranch as an addition to state park, preserving one of the canyon's most dramatic vistas for enjoyment by generations to come.